Last week, Jeff Sessions attacked a court ruling that gave a temporary reprieve to hundreds of thousands of immigrants facing imminent deportation after years of living lawfully in this country. Complain as he might, the judiciary indeed has a say, because the executive branch has to follow the law and, most important, the Constitution. As the court found, the administration violated both federal law and the Constitution’s protection against race discrimination when it attempted to terminate the lawful immigration status of these individuals. As a result of the ruling, more than 300,000 immigrants will be able to stay in this country for at least another year — even as the government appeals the decision. Sessions was responding to a ruling that came earlier in the month concerning the Temporary Protected Status (TPS) program. TPS provides legal status to residents of certain countries that the U.S. government has deemed too unsafe for return. The Trump administration started stripping protected status from TPS holders, one by one and country by country, shortly after the inauguration. It has since ordered the end of TPS for 98 percent of the people who were protected under the program on Election Day in 2016. Even for those who do not follow immigration law closely, the TPS program may ring a bell, because it prompted one of President Trump’s more infamous expletives. In January, during a conversation about the TPS program the president was having with some Republican senators, he rejected an immigration proposal that would have granted many TPS holders lawful permanent residence. He asked why we need to allow “people from shithole countries” to stay here and said we should instead be trying to encourage more people from Norway to come. Since the beginning of the Trump administration, DHS has announced the end of TPS for recipients from El Salvador, Haiti, Nicaragua, Sudan, Honduras, and Nepal. A few months later, we joined with the National Day Laborer Organizing Network and the law firm Sidley Austin LLP to challenge the administration’s termination decisions for the four countries whose TPS status was terminated at that time — El Salvador, Haiti, Nicaragua, and Sudan. We argued that in its moves to terminate the program, the Trump administration had acted out of racial animus against non-white, non-European immigrants, and also that it had adopted an extremely narrow interpretation of the TPS statute without adequate justification, in violation of the Administrative Procedures Act. As we learned from documents we obtained in our lawsuit, Trump administration officials (some of whom came from the far-right anti-immigrant group Federation for American Immigration Reform) took jobs in DHS and used their positions to push for the termination of TPS, even where career professionals within the agency believed that the law required it to continue. 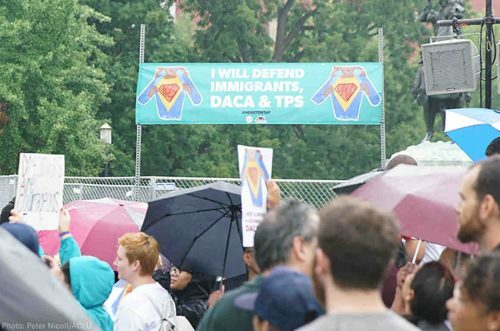 The documents show that Trump administration officials believed that if they ended TPS, Congress would face tremendous pressure to grant permanent legal status to those now at risk. In turn, the administration could leverage the manufactured crisis in negotiations over other harsh anti-immigrant measures it wanted to pass. In short, the Trump administration used hundreds of thousands of people as political pawns. In October, the court blocked the administration from ending the program, granting at least temporary reprieve to TPS holders from those four countries. The government has appealed, but meanwhile, it has also announced a plan to comply with that order. The plan ensures that all TPS holders will continue to have status for at least one year. Even if the government wins on appeal, it has agreed to allow people to continue holding TPS status for at least six more months after the case ends. In his statement criticizing our lawsuit, the attorney general suggested that ending TPS was needed to secure the border. This is absurd. There is no evidence anywhere that TPS holders present a threat to the border or to national security. In fact, the only relevant evidence showed the opposite: that ending the lawful status of around 300,000 people who lived here lawfully, with work authorization, for nearly 20 years, will not make us safer. Even the Southern Command of the U.S. military recommended against ending TPS for these countries before these decisions were made out of concern for the political instability that could arise from the mass deportation of several hundred thousand people who had lived here for decades. A number of state governments were also very concerned about the impact of the administration’s decisions. They filed a brief in support of the TPS holders, noting they have paid billions in taxes and contribute a great deal to both the economic and social life of the country. Perhaps what’s most concerning is the fate of the American-born children of TPS holders. They face a particularly brutal choice, and just discussing it with our teenage clients is painful: They can stay here in their country, or they can continue to live with their parents, but they cannot do both. The children of immigrants facing deportation have had to make such choices for many years under our harsh immigration laws. But we are not aware of any previous time in our nation’s history where so many people who had lived lawfully in this country for many years have lost their lawful status without having violated any law. Our lawsuit has secured valuable time for TPS holders and their families, but the only truly just solution is for Congress to grant them lawful permanent residence. In the meantime, we are grateful for the temporary relief. More inaccurate b——t from the ACLU. They are not being removed, they are having their visas non-renewed. If after their visas expire they overstay they they will be subject to deportation.